Droughts that are extreme by today’s standards will be normal by the end of the century, according to NASA research. A reservoir on the lower Colorado River, Lake Havasu is the starting point for the Central Arizona Project, a 541-kilometer (336-mile) canal that moves Colorado River water to Phoenix and Tucson. Click image to enlarge. If the world continues to add carbon to the atmosphere at current rates, ‘megadroughts’ lasting more than two decades will be commonplace by the end of the century in the driest region of the United States — the triangle from Texas to South Dakota and California — according to the most comprehensive study to date of drought risk in the western United States. Moreover, the end of the 21st century will likely be drier than any period in the last millennium as a result of heat-trapping gases in the atmosphere, the researchers found. Earlier studies hinted at the magnitude of the changes, prompting water managers in California and the Colorado River Basin to begin changing their management practices and assessing risks to their water supplies. The study published today in the journal Science Advances adds new depth to a large body of drought research and reveals an even greater risk from climate change to the Great Plains and Southwest than previously thought. A team of scientists led by Benjamin Cook of the NASA Goddard Institute for Space Studies used tree-ring data to look back in history and multiple computer models to peer into the future. They assessed changes to the wetness of soils — a marker of drought — by analyzing the influence of both temperature and precipitation. The results should give pause to those from Kansas wheat fields to the California coast. According to the study, there is a greater than 80 percent chance of a multidecade drought in the last half of the 21st century for those two regions, both of which are significant farming belts and home to some of the largest U.S. cities and biggest state economies. These heightened odds of long-lasting drought are compared to a 12 percent chance for the 50 years after 1950. Cook’s assertions may seem hyperbolic, but several prominent climate scientists who study drought said that the paper is a thorough and novel analysis that merits attention. “It’s a wakeup call kind of paper that I’d take seriously,” Jonathan Overpeck wrote in an email to Circle of Blue. Overpeck is a University of Arizona climate scientist and a lead author for the United Nations’ climate assessments. “[The paper] highlights how rising temperature really will be hard on our water supply in a large swath of the United States, including the Southwest stretching from California to Texas,” Overpeck wrote. This region is currently in the middle of a dry cycle that has lasted four years in California, five years in Texas, and more than 14 years in the Colorado River Basin. 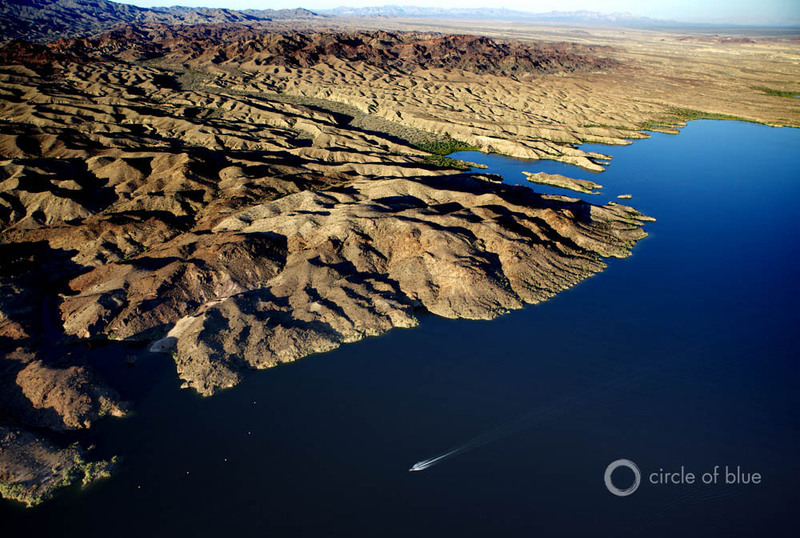 Water managers in the Colorado River Basin have included the megadrought concept in river flow projections for nearly a decade, Colby Pellegrino told Circle of Blue. Pellegrino is the Colorado River program manager for the Southern Nevada Water Authority, which supplies Las Vegas. Pellegrino cited two agreements signed last year — one between the Bureau of Reclamation, which manages dams, and several large water utilities; the other between Arizona, California, and Nevada — that respond to changing conditions. Both agreements focus on conservation and keeping more water in Lake Mead in order to delay or avoid mandatory restrictions on water withdrawals from the big reservoir. Smaller, regional studies that assess climate changes at the watershed scale are more helpful for Colorado River water managers, Pellegrino said. Those analyses help determine the potential consequences for the basin, she explained, but each state must determine the level of risk it is willing to take regarding a decrease in water supplies. Overpeck was a co-author on a paper published last October in the Journal of Climate that examined megadroughts, a concept loosely defined as a drought lasting multiple decades. That study also used tree-ring data to look backward. However, it did not take temperature into account, only changes in precipitation. The NASA Goddard study moves the analysis a step farther by adding temperature to the equation. Higher temperatures cause water to evaporate, which dries out soils and reduces the water available for humans and ecosystems. Residents of California and the Pacific Northwest are seeing a preview of such conditions this winter as record heat, as much as 3.3 degrees Celsius (6 degrees Fahrenheit) above normal, pummels a scant snowpack. Michael Wehner, a climate scientist at Lawrence Berkeley National Laboratory and also a United Nations climate assessment author, held the paper in similar regard. “To me, this is completely intuitive, and should be taken seriously,” Wehner told Circle of Blue. Wehner published a study in 2011 on drought projections for the United States. To assess drying conditions, his analysis used the Palmer Drought Severity Index, a measure of drought that has been criticized for making warmer regions seem drier than they are. To circumvent this problem, the NASA Goddard study used the drought index plus a group of 17 climate models to assess soil moisture changes at two depths: 30 centimeters (1 foot) and 2 meters (6.5 feet). The uppermost layers are most relevant for farmers and ecosystems, Cook said. Wehner pointed out that it is agriculture that should be most concerned with the widespread drying. He referred to a concept called “agricultural drought” which means that insufficient precipitation or dry soil conditions hinder plant growth. Today, farmers switch crops or pump groundwater to compensate for lack of rain or dry soils. With groundwater reserves in many parts of the West being depleted, that option, without changes in management practices, will be increasingly unavailable, Cook said.